Blog Teeth Have White Spots? What Can Be Done? Teeth Have White Spots? What Can Be Done? Beware there are many false facts out there about fluorosis! It is important to know the role of fluoride and how we can maximize it’s effectiveness without doing any harm. This video below does a great job explaining how to balance the effects fluoride can have good and bad. Having hypoplastic tooth enamel means having a thinner or less mineralized layer of enamel than usual. Usually this involves the tooth having pits in it. Because these pits are porous this leaves teeth vulnerable to stains and tooth decay. It can be caused in teeth by a variety of sources such as hypocalcemia, birth injury, fluorosis, infection, chicken pox that was undiagnosed and untreated. This type of discolorization is usually treated with bonding on the teeth until the person becomes an adult at which time dental veneers can become an option. This is Dr. McOmie’s pet peeve!! There is absolutely NO reason for this and we should NEVER see it. Having braces makes your teeth particularly vulnerable to decalcification. It takes more effort to reach all those tiny crevices where plaque can build up, and any change in the color of your teeth won’t affect the patches beneath the brackets. With braces, therefore, it’s not only important to brush and floss thoroughly to keep plaque and tartar at bay. Braces take a little extra work to keep clean maybe 1 minute extra a day. Really it isn’t that much more work. We place most of our kids with braces on a fluoride rinse because they are going to get some acid attack on their teeth, we want that to be minimized. 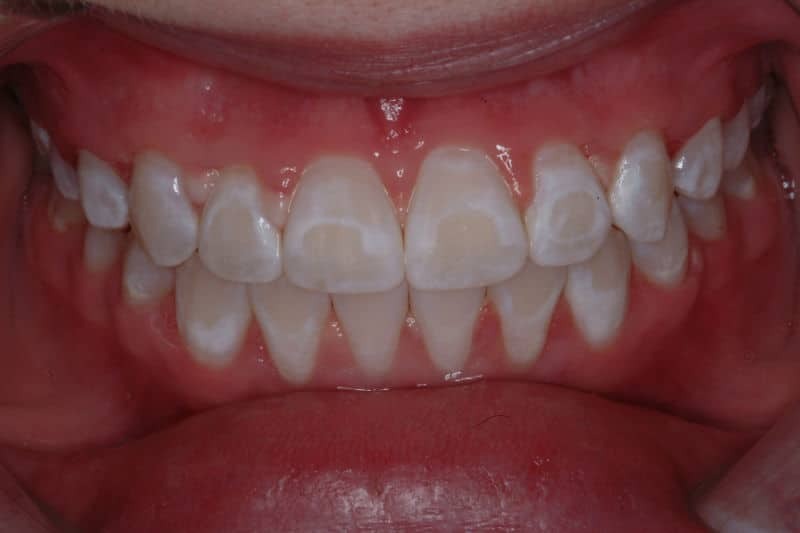 Dr. McOmie would rather see crooked teeth then demineralized straight teeth. Braces should only be done on people who are committed to doing what it takes to take care of their teeth with the braces on. It is ridiculous to have straight teeth that were damaged by the braces. It makes no sense. Bonding works really well when we need to cover a small amount of stain or fill in a pit that is attracting stain. If you have lots of stain, severe pitting or are looking for the ultimate cosmetic result then veneers are for you. Bonding works well we use bonding on young adults and children instead of veneers then do veneers when they become adults and their teeth have erupted all the way. And more, every person is different and there may be another alternative to what is listed above for you. Come in and let our dentists look at you it probably isn’t as bad as you think it is. If you’re concerned about preventing white spots, brown spots, pits or already have them and would like to discuss treatment, don’t hesitate to schedule an appointment! McOmie Family Dentistry 423-899-1112.